For the 7th year running, Aatif Nawaz will be performing at the Muslims LOL Comedy Show. This year, the show will be a part of the London Muslim Lifestyle Show on the 15th and 16th of April 2017. Also on the bill are award-winning comics Mani Liaqat and Prince Abdi. Tickets and further information can be found by clicking here. The follow up to Aatif Nawaz's critically acclaimed 'Muslims Do It 5 Times A Day' and 'AATIFicial Intelligence' comedy show has been announced. Stay tuned for more information about 'The Last Laugh'. This March, Aatif Nawaz will be joining cricket legends Brian Lara and Waqar Younis on a very special tour entitled 'Up Close & Personal'. The tour will be comprised of 4 events in Bradford, Birmingham, London and Manchester. Aatif will be hosting and conducting a Question and Answer sessions with the cricketers in aid of the Muslim Aid charity's Pakistan Youth Project. Tickets for these very special events are available by clicking here. On the 8th of April, Aatif Nawaz will be performing at a special Asian Comedy Show at the Watford Colosseum alongside comedy stars Paul Chowdhry, Anil Desai, Hyde Panaser, Sindhu Vee, Kai Samra and Reem Adam. The event is brought to you by QT Promotions and tickets are available by clicking here. 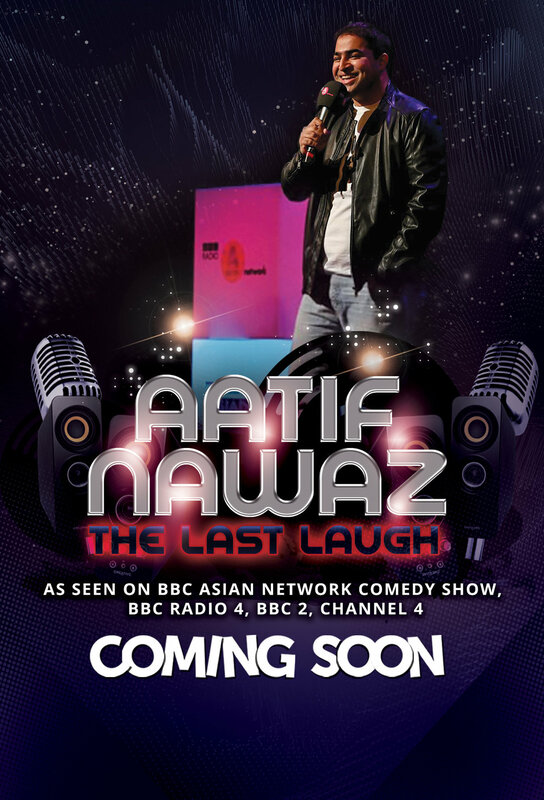 Aatif is one of the acts featured on the BBC Asian Network Comedy Show currently available on BBC IPlayer. Click here to watch 45-second trailer for the programme. Or click here for the full comedy show on BBC IPlayer (Aatif kicks in from 35 minutes in). Aatif made his BBC Radio 4 presenting debut with Clock Face - a programme about the history of the time-piece. It is the part of the Inconspicuous Consumption series produced by Testbed Productions. The programme is available on BBC IPlayer now. Click here to listen. On Saturday the 10th of February, Aatif will be performing at a special comedy night in Birmingham at an event in aid of the Anzal Begum Foundation. The event will also feature performances from comedians Mani Liaqat, Salman Malik and Jay Islam. Tickets can be purchased by clicking here. On Saturday the 4th of February, Aatif will be performing at a very special event organised by Salaam Events and Halal Eat. The event will also feature comedians Sadia Azmat and Ali Official and other performances from Khaled Siddiq and Khaleel Muhammed, with Rahim Jung serving as host. The show will be in aid of the Penny Appeal charity and tickets can be purchased by clicking here. On Thursday the 2nd of February, Aatif will be making his debut presenting a programme on BBC Radio 4. The programme is called 'Clockface' and is part of the 'Inconspicuous Consumption' series. After its live broadcast at 11:30am, it will be available on BBC IPlayer on demand and can be heard by clicking here. 'Clockface' is produced by Testbed Productions. Aatif will be performing on the BBC Asian Network Comedy Show at the Watford Palace Theatre on Friday the 27th of January 2017. The event will later be broadcast on BBC Three, BBC IPlayer and BBC Red Button. Tickets for the live show, which will also feature performances from Tez Ilyas, Nabil Abdulrashid, Amir Koshsokhan and Sukh Ojla, can be found by clicking here. This December, Aatif will be part of a line-up touring 25 cities across the UK with a very special comedy show. Alongside Aatif Nawaz will be Imran Yusuf, Nabil Abdulrashid, Mo Amer, Aamer Rahman, Guz Khan and Tez Ilyas. The tour is in aid of Human Appeal International. Tickets are on sale now and can be booked by clicking here. On the 1st of November, Aatif appeared on Newsnight on BBC 2 as part of a discussion on comedy and freedom of speech. The show can be viewed on BBC IPlayer until the 27th of November 2016. Click here to watch. On Tuesday the 22nd of November, Aatif will be performing on Halol Entertainment's 'Hinglish Comedy Night' at the Comedy Cafe Theatre. The line-up includes Imran Yusuf, Sindhu Vee, Shazia Mirza, Nabil Abdulrashid, Hyde Panaser and Mickey Sharma. Tickets can be booked by clicking here. Following the completion of the AATIFicial Intelligence Tour, Aatif will be performing at the Muslim Lifestyle Expo in Manchester on Saturday the 29th of October. Tickets information can be found by clicking here. On Saturday the 24th of September, Aatif will be headlining Oi Oi Comedy's Silly Saturdays comedy show at the Caroline of Brunswick in Brighton. You can book tickets for the show by clicking here. Aatif Nawaz's critically acclaimed Edinburgh Fringe Comedy show is coming to London. There will be two special performances of AATIFicial Intelligence at the Museum of Comedy in London on 30th September and 1st October at 8:45pm. Tickets are on sale now. Book now to avoid disappointment. Following his run at the Edinburgh Fringe Festival, Aatif will be joining a line-up that includes legendary Pakistani cricketers Shoaib Akthar and Mohammad Yousuf, as well as TV presenters Iqrar ul Hassan and Na'eem Raza on the Pride of Pakistan tour. The tour will be visiting London, Birmingham, Bradford, Newcastle & Glasgow. You can book your tickets by clicking here. AATIFicial Intelligence has been praised not only by critics and reviewers, but also audiences. Here is a selection of reviews from audience members who attended various performances of AATIFicial Intelligence at the 2016 Edinburgh Festival Fringe. Aatif will be performing his brand new comedy show 'AATIFicial Intelligence' at the 2016 Edinburgh Festival Fringe. The show will be performed every night from the 4th to the 28th of August at The Newsroom. For more information about the show, click here or to watch the trailer, click here. Aatif will be performing on the HaLOL Eid 2016 Comedy show in London in Saturday the 16th of July. The show will take place at the Rich Mix and will also feature performances from Shazia Mirza, Imran Yusuf, Bilal Zafar, Darius Davies and Omar Hamdi. Tickets are available by clicking here. Eid Mubarak Everyone!